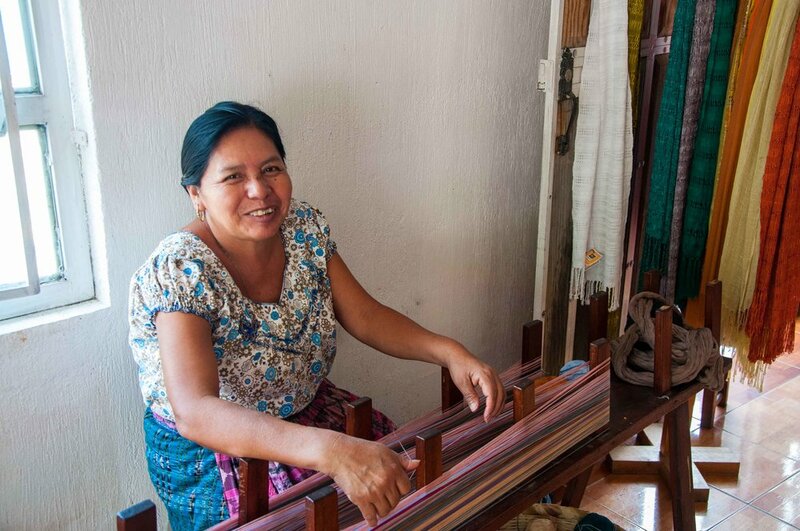 ixöq's success and value to the women of Guatemala are dependent on our partnerships with local community groups. The women artisans we work with are employed by these groups, from whom they receive the training, support and supplies needed for their craft, as well as market opportunities that otherwise may be inaccessible. 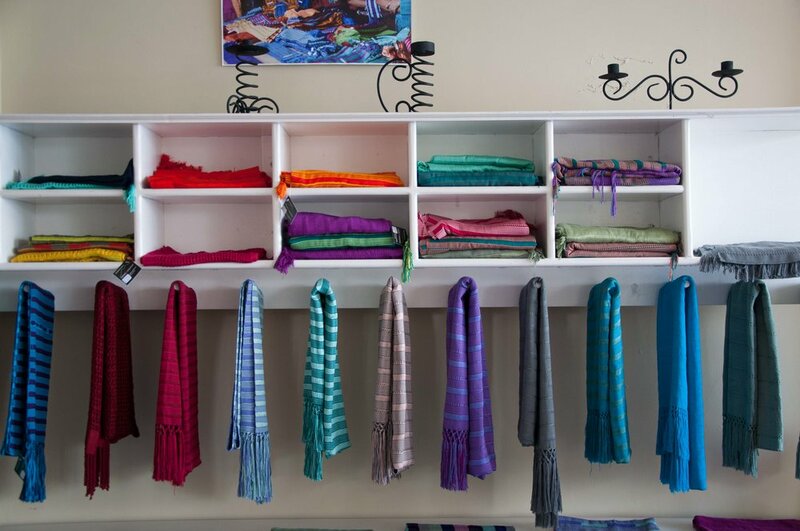 Many of the products are handmade in the homes of the women, allowing them the flexibility to maintain their home while also contributing financially to their and their family's livelihood. Through this work the women feel more empowered and gain financial independence and stability. The three groups we currently work with are Manos Cruceñas, the artesinia program of Amigos de Santa Cruz in the village of Santa Cruz la Laguna, and Asociación Lemá, a women’s weaving cooperative in the village of San Juan la Laguna and ASPECOM, a women’s cooperative in San Cristóbal, Totonicapan. A few of the amazing women we work with are profiled below. Manos Cruceñas is the artesinia program of Amigos de Santa Cruz in the village of Santa Cruz la Laguna. 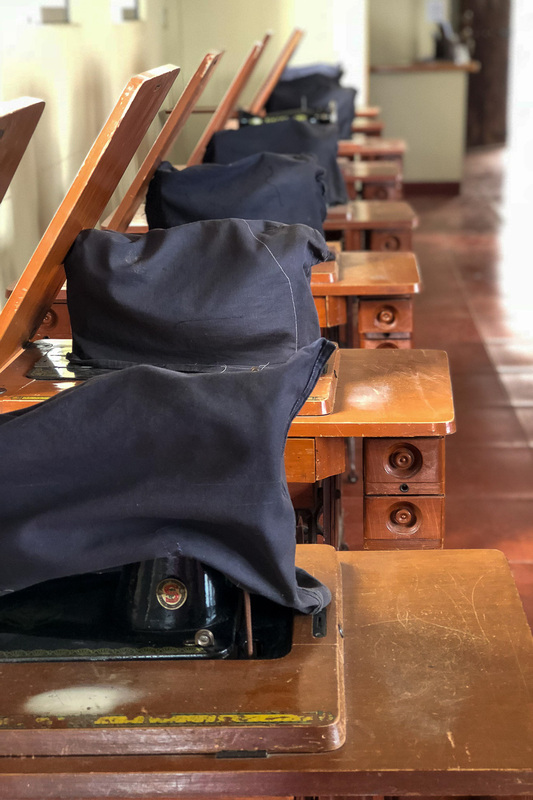 The mission of Amigos de Santa Cruz is to improve the lives of the people of Santa Cruz la Laguna and surrounding communities through support for education and sustainable economic development. The women of Manos Cruceñas receive vocational training in sewing, foot loom weaving and beading through CECAP (Centro de Capacitacion), the vocational education center under Amigos de Santa Cruz. CECAP, established in 2007, allows people of all ages to learn new skills that lead to meaningful work and, in turn, a more prosperous community. “Amigos” started out in 1998 as an effort to help support education by providing the local school with needed books and supplies. Almost 20 years later, the organization has grown to not only support the local schools, but to support the local students and their families with youth leadership, rural women’s empowerment, reproductive health education and vocational training programs. 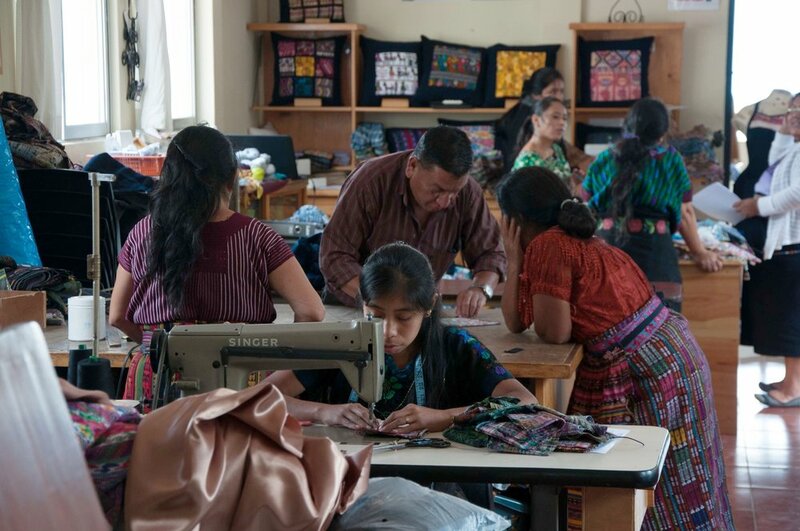 Amigos began its artesania vocational training program in 2011 with programs for young women and mothers to learn to sew, weave and bead products that appeal to Guatemalan tourists. In 2013, Amigos opened the Manos Cruceñas Artisan Store, a social enterprise business that provides a venue for the the graduates of the program to sell their products. Learn more here. The Asociación Lema’ is a women’s cooperative of Tz’utujil women in San Juan La Laguna. 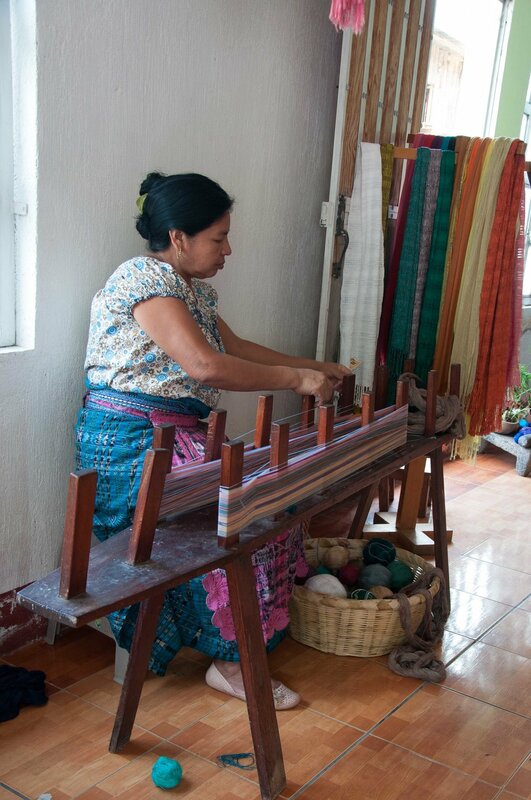 The women pride themselves on making handmade textiles with natural dyes and materials, in keeping with their Mayan culture and traditions. Together they have formed a cooperative association to make and sell products made from high quality hand woven textiles. The products are sold at a fair price and provide work and income for the women of San Juan, with the goal of increasing the the quality of life for their families and the entire village. Lema’ is the Tz’utujil name of one of the trees used to dye the threads in their products. Learn more here. ASPECOM (Asociacion Pensamiento y Corazón de las Mujeres or The Women's Thinking and Caring Association) is the most recent addition to ixöq's list of partners. Founded by Rutilia Ramos in the town of San Cristóbal, Totonicapán, ASPECOM is a small group of women, comprised of single parents or widows needing additional income for their families. In 1976 Rutilia was a traditional midwife, working in San Cristóbal, when a devastating earthquake hit Guatemala. She worked tirelessly to help combat the malnutrition affecting the children of San Cristóbal in the quake's aftermath. She witnessed a huge improvement in the children once their diet improved and decided that she would continue to help the children of her town. She formed a group of mothers and they began to create and sell items to support children and families and help improve their nutrition. Twenty-one years after the earthquake, the group officially established ASPECOM and their work continues. The women artisans have many interests and talents, making natural medicines, jams, salsa, jewelry, embroidery and handwoven baskets. ixöq partners with the artisans of ASPECOM to design and create the handwoven totes and purses that we call "cestas". Each bag is a designed by ixöq and handcrafted from recycled plastic by the women of ASPECOM. We work with some amazing artisans who sew, weave, bead and create. They are motivated, hard working women who benefit from the use of their vocation and are thus able to gain financial independence and help support their families. Below are stories from a few of the women from Amigos de Santa Cruz. We will continue to add stories along the way as we learn about each woman. Ana is a weaving artisan for Manos Cruceñas Artisan Store (the retail store for Amigos de Santa Cruz) who makes beautiful scarves for ixöq using a belt-loom. She is 65 year’s old and lives with her husband and seven children. Ana also makes the traditional Santa Cruz red blouses (Ana is wearing one in the photo) for sale in the village of Santa Cruz. Working as a weaver allows Ana to cover her expenses at home as she and her husband have limited work opportunities now they are getting older. Ana is very grateful for the opportunity to work with Manos Cruceñas over the past 5 years and most recently for ixöq and looks forward to continuing to weave beautiful products to support her family. 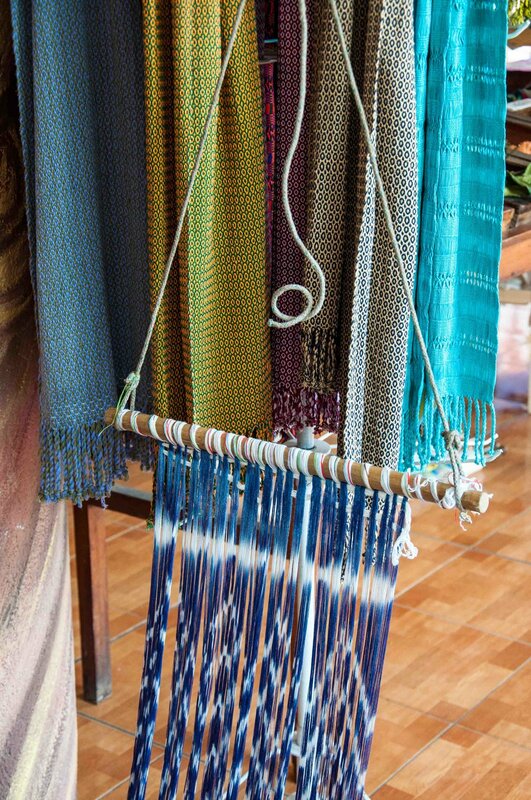 Maria makes the lovely shawls for ixöq and the Manos Cruceñas Artisan Store. She is 43 and married with eight children. Maria has been working with Manos Cruceñas for 5 years making products for retail and wholesale orders. Maria is happy that her work supports her children and allows them to get a good education. Juana learn to sew 2 years ago and now makes wonderful products from upcycled traditional Guatemalan materials (jaspe) for Manos Cruceñas Artisan Store & ixöq. Juana had always dreamed of working with artisanal accessories and she’s now very happy to have achieved that dream. Juana is 33 and married with two children. Juana wanted to get a good education but was unable to continue with school and instead married when she was 19. Until the past two years she had not worked outside the home but is now feels confident in herself because she is generating her own income to help support her family and kids’ education. Francisca is 28 year’s old, single and is a fantastic beading artisan! She’s been beading since taking a course in the CECAP Vocational Training Center at Amigos de Santa Cruz in 2012 and made many of the beaded products sold by ixöq. Francisca loves being independent and wants to work on her skills to better her quality of life. Due to lack of financial resources, Francisca only studied until the end of primary school but she’s happy that despite that she can earn an income working with Manos Cruceñas. The artisans stories were written in collaboration with Amigos de Santa Cruz and based on personal interview with each artisan. And for those who are map/geography curious here's a map of Lake Atitlán, Guatemala. Amigos de Santa Cruz is located on the north shore in Santa Cruz La Laguna, and Asociación Lema is located in San Juan La Laguna which is a small village on the west shore of the lake, slightly northwest of San Pedro La Laguna. ASPECOM is located in San Cristóbal, Totonicapán, to the north-east of Lake Atitlán.